This trip is high on a ridge and gives an opportunity to look down into the deepest parts of both Topanga Canyon and Santa Ynez Canyon. Reach the trailhead by turning east onto Entrada Road from State Hwy 27 just north of the town of Topanga. Once on Entrada Road turn left at every street intersection. Drive 1.1 miles to the entrance to Topanga State Park. Leave the east end of the parking lot and go uphill on a fireroad. This road intersects a road that runs along the ridge at "the Latitude." Turn right and start a gentle climb along an oak shaded road that quickly crests out on the ridge between Topanga Canyon on the west and Santa Ynez Canyon on the east. Notice the rock underfoot. Since leaving Trippet Ranch the base rock has been sandstone. Now we are on volcanic rock and have just crossed the east-west trending Topanga Fault. Volcanics intruded into the existing sandstone about 15 million years ago during a period of volcanic activity in the Santa Monica Mountains. For the next two miles most of the rock along the route is volcanic with a few areas of sandstone. This east Topanga ridge gives breathtaking views of the lower part of Topanga Canyon and one can sense the power of the stream that has cut this gorge through the mountains to a depth of more than 1000 feet. Periodically Topanga Creek demonstrates this force by cleaning out some of the man-made structures such as roads, bridges, and buildings that impinge upon the creek bed. The hillside housing on the west side of the canyon is the Fernwood tract of Topanga. The Santa Ynez Canyon view is equally spectacular with its network of ravines, and massive sandstone slabs of tilted rock. Two trails drop down from the fireroad to Santa Ynez Creek. One, about a mile and a half from the start of the hike, leaves the road near Peak 1629. (This is a sandstone knoll west of the road.) The trail is east of the road and is difficult to pick up because of bulldozer activity destroying the first couple hundred feet about 1978, and the trail has not been used since. The trail is steep, going through a beautiful chaparral forest, and bottoming out through a lot of Poison Oak just before reaching the stream. The other trail begins about 450 yards farther south on the road and is really overgrown. These trails are not part of this hike and are mentioned only for those with a strong urge for adventure. 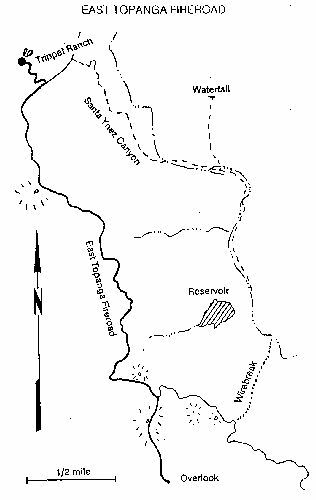 When the land for Topanga State Park was being purchased for what is now the second largest urban park in the United States and the largest wildland within any city in the world, lower Santa Ynez Canyon was not included. This effectively blocked what could have been the main entryway for the people of greater Los Angeles. The housing development in Santa Ynez Canyon is Palisades Highlands. Continue south along the ridge until coming to a road on the right about 2-1/2 miles from the trailhead. This road turns into a firebreak as it follows a sandstone ridge out to "the Overlook," a high point with an exceptional view of the Pacific Ocean. Return the way we came.